The rectangle sketching tool is another useful and important tool for making various 3D model parts. You can draw rectangle by selecting the tool from The Sketch toolbar or from menubar. The rectangle tool contains 4 rectangle drawing methods and one parallelogram option. In this SolidWoks tutorial-4, you are going to see each how to draw each one of the rectangles and parallelogram with images and rectangle property manager menu in detail. Note: This is just tutorial showing how to use Rectangle tool, not showing any product drawing or designing in it. If you are advanced SolidWorks user please avoid it. This Solidworks tutorial is for beginners, students or people likes to learn about SolidWorks. There are 4 Types of Rectangle sketching methods. They are Corner rectangle, Center Rectangle, 3 Point Corner Rectangle and 3 Point Center Rectangle. Each one of the methods is explained in step by step with images. 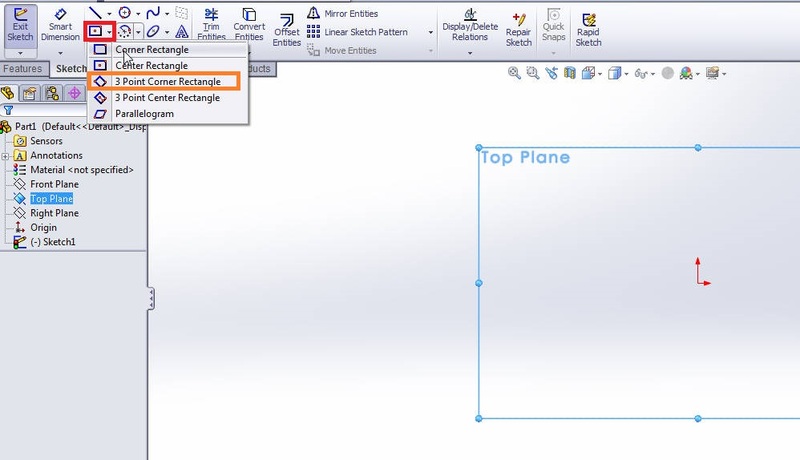 The Corner Rectangle is same as rectangle, but its two opposite corners are used for sketch it on Solidworks UI. From the command manager, you can see the sketch toolbar and select the “Corner Rectangle” button as shown below. Drag your mouse pointer to the Sketch work area. Then click anywhere on the interface to fix the one corner of the rectangle and move pointer opposite the fixed corner. Then you can see rectangle is developing in the interface. And click again to fix another corner also. Don’t worry about the dimension; you can do it by using the “Smart Dimension” tool. The center rectangle sketch tool needs a center point and a any one of the corner point to form complete rectangle. Follow the Step 1 in the Corner rectangle drawing tutorial. From Sketch command manger, select the “Center Rectangle” as shown in the figure. Drag your mouse pointer to the graphics area and select any point by clicking the left mouse button to select the rectangle center point. Then again move the mouse pointer to any one of the side to select the corner point and click the left button. Then it forms a center rectangle on the interface. To draw 3 point corner rectangle, you need three corner points to complete the rectangle. From Sketch command manger, select the “3 Point Corner Rectangle” as shown in the figure. Drag your mouse pointer to the sketch work area and click left mouse button to fix the first corner. Then move the pointer to sideways and click to select another corner and precede same for the third corner selection. Your 3 Point rectangle is now completed. To draw 3 point center rectangles, you need to select a center point and two corner points. Follow the same Step 1 in the Corner rectangle drawing tutorial. Select the “3 Point Center Rectangle” tool form the command manager. Drag the mouse pointer to the drawing area. Click the left mouse button to select the center point. Then move to sides to select the midpoint between two corners of a rectangle and again move your pointer in perpendicular (90degre) to select the corner point. Then you can see the completed 3 point rectangle. To draw parallelogram, you need to set 3 successive corners. Select the parallelogram tool from the command manager. Drag the mouse pointer to the work area and click to select the first corner then move to right or left in linearly to select the second point. Then move to upward direction to select the 3 successive point. Then you can see the completed parallelogram. You can also access the rectangle sketching tools by using the SolidWorks menubar. From the menubar, select the Tools menu. From the drop down menu, select the “Sketch entities”. Then you can see side drop down menu that contains complete rectangle tools. The property manager of rectangle sketching tools helps to adjust the dimensional and their positions in the X-Y axis or plane. Let us see the each components of the property manager menu. Rectangle Type: In this section, you can select any rectangle type such as corner, center, 3 point corner, 3 point center and parallelogram. Existing Relations: If you select the each portion of the rectangle by using “select” tool, you can see the existing relations. Options: If you want to make your rectangle under construction views, check the “For Construction” option. The “Infinite length” helps to make any side of your rectangle length to infinite. Parameters: here you set the dimension of your rectangle size. You can also adjust the XY position of rectangle corners.